Andrew F. Garruto began his legal career as a judicial intern for the Honorable Stanley R. Chesler, U.S. Magistrate, (now U.S. District Court Judge), in Newark, New Jersey. He then worked as a Judicial Law Clerk for the Honorable June Strelecki, Judge of the NJ Superior Court and then for the Honorable Arthur J. Blake, Judge of the NJ Superior Court. 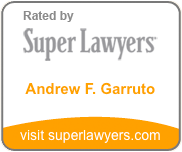 In 1992, Andrew Garruto became a trial lawyer in an active litigation firm before practicing law on his own. His newly built office is located in his hometown of Nutley, New Jersey, and he also has an office in downtown Manhattan. Mr. Garruto concentrates his practice to personal injury claims, involving any incident where one’s negligence causes injury to another, as well as Workers’ Compensation claims.